The Lean Construction Institute’s goals and strategies are addressed by committees led and made up of member volunteers, with board members serving as liaisons. Each committee below has a broad range of goals and objectives it is pursuing throughout the year. The LCI Congress planning team is tasked with steering the theme and content of LCI’s largest event, the annual fall Congress, while seeking opportunities to drive more value for attendees into the program. As the LCI Congress location rotates each year, so does the planning team to include the industry thought leader perspectives specific to the region. The planning team takes the lead on reviewing abstracts and shaping the content over the five-day program while LCI staff takes the lead on logistics. Continuous improvement is embedded into the process with past attendee survey analysis and several knowledge transfer calls with the previous Congress planning team to the new team before they begin planning. For more information on LCI Congress, email Joan Piccariello at joanp@leanconstruction.org. The LCI Education Advisory Group is comprised of industry volunteers who develop Lean education material such as courses and publications for practitioners seeking to improve project delivery through a culture of collaboration and continuous improvement. The group also creates and maintains standards in the form of common language, basic practices and fundamental principles. Click here for a list of contributing group members. For more information on LCI Education, email Kristin Hill at khill@leanconstruction.org. The LCI Lean Leader group launched in 2017 to support and expand LCI's mission to transform the built environment through Lean implementation and education. The current group is working to benchmark awareness of Lean design and construction among university students, with future goals of providing student resources for Lean education. By cultivating a groundswell of up-and-coming practitioners who are already aware of Lean design and construction, we can work together to spread the core tenets of LCI to others. For more information on the Lean Leader effort, email Andrea Mowers, amowers@leanconstruction.org. Creating a demand for Lean project delivery driven by owners is a top priority for LCI. The LCI Owner Committee is a team of owners focused on targeting outreach to C-Suite leadership at owner companies in key markets, developing and supporting Owner Communities of Practice, and bolstering Lean training, research and mentoring among owners. For more information on the LCI Owner Committee, email Shannyn Heyer at sheyer@leanconstruction.org. 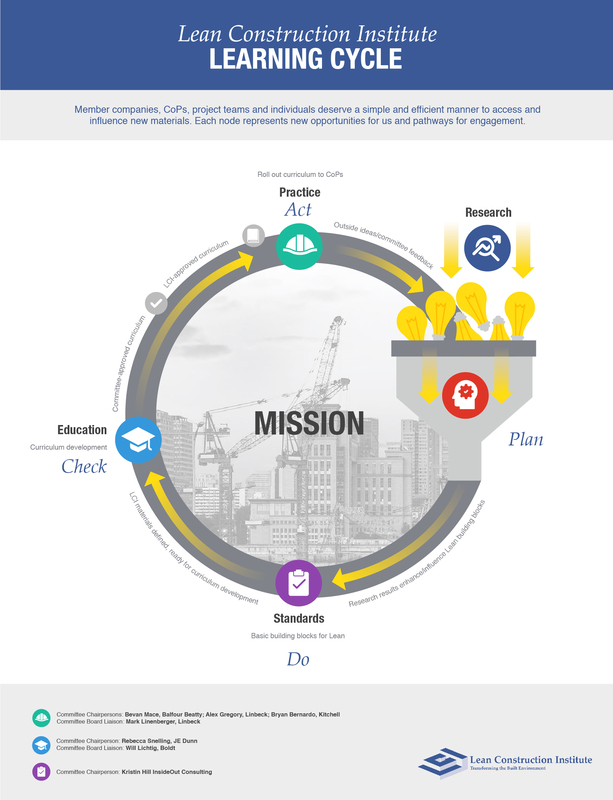 The Practice Committee oversees LCI's Communities of Practice (CoP), which provide a meeting ground where members of the Lean community can gather, learn, connect and explore the ramifications of these ideas both for their own organizations and the larger industry. For more information on LCI Communities of Practice, email Denise Erminger at derminger@leanconstruction.org. The LCI Research Committee is chartered to develop goals and work plans for the Lean Construction Institute relative to research. It seeks to develop knowledge through research-related programs, defining basic research needs and making available the results of applied research to other LCI committees, our members, and our Communities of Practice. It is supported by an LCI staff research director in achieving its goals and objectives. The committee develops partnerships and collaborates with research programs in universities, institutes and foundations to identify and obtain useful research findings. It promotes the development of programs of higher learning in Lean and related disciplines, and will seek over time to help place more and better-trained students in LCI member companies. For more information on the LCI Research Committee, email Dan Heinemeier at danh@leanconstruction.org. LCI’s Learning Cycle follows the Plan, Do, Check, Act (PDCA) sequence. It begins with research funneled into the learning cycle, which is incorporated in a plan and in turn influences development of “standards” or Lean building blocks. These are handed off in turn for content/curriculum development, which once approved is made available through our CoP events, seminars, and other national training activities. But the cycle doesn’t end there. Instead, feedback from instructors and those trained is funneled back into the research cycle, and the learning cycle repeats itself in the spirit of continuous improvement.